A smile makeover refers to the entire dental process involved in giving you a better smile. Your dentist can give you a smile makeover by using cosmetic procedures such as dental veneers, whitening your teeth and tooth implants. Depending on the result you want to achieve, a smile makeover might include many procedures, some restorative and others cosmetic. The amount of gum tissue affecting your smile. As these features vary from one individual to another, smile makeovers have to be customized to fit your individual features. The color of your teeth can be improved by whitening or using porcelain veneers. If you have silver fillings, they can be covered or replaced with porcelain ones. When using porcelain veneers, you will be required to choose color shades that will give you a brighter, natural-looking smile. Crooked teeth or teeth with gaps between them can be aligned using orthodontic procedures and their appearance can be improved using veneers. Missing teeth not only make your smile unappealing, but also interfere with how you chew and speak. Your cheeks will also sink in if some of your teeth are missing. Your dentist can fix this problem using dental implants, porcelain dentures and porcelain bridges. If you have broken or chipped teeth, they can be fixed using cosmetic bonding. When your gum tissue conceals a large portion of your teeth, this will make your smile appear odd and make you self-conscious. Recontouring your gum or surgically eliminating excess tissue, will give your smile a more natural appearance. If your face is misshapen due to aging or other factors, oral maxillofacial surgery or orthodontics will help to restore your smile and make your face appear shapelier. As you age, your teeth will wear out and appear shorter. 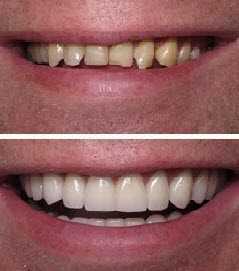 Longer teeth can be achieved by lengthening your front teeth with porcelain veneers or crown lengthening through periodontal procedures. The smile line refers to the curve achieved by your lower lip during a smile. Using cosmetic procedures, your dentist can re-contour your upper teeth to ensure they follow your smile line. Your teeth can also be reconstructed to make your two front teeth more dominant. Other adjacent teeth will also need to be reconstructed to achieve proper length and width proportions associated with a great smile. The right texture can make your smile look more feminine or more masculine. With proper care, you will not need any replacements for at least 10 to 15 years. Care and maintenance routines will vary depending on the dental procedure that has been used to recreate your smile.